I will respond to Plimer’s main points. This will be a long posting, so apologies! I will identify Ian Plimer’s points as (IP) and my response as (SH). (IP) It is claimed that there is a scientific consensus about human-induced climate change. There is no consensus. Consensus is a process of politics, not science. Science is married to evidence, no matter how uncomfortable. (SH) The word consensus is used to show that the overwhelming majority of informed scientists agree that there is a greenhouse effect; that C02 is a greenhouse gas (GHG hereafter) and that these have increased enormously in the atmosphere and that recent warming is largely being driven by this. There is also consensus in other parts of science (Newtonian Physics, Quantum Physics, Evolution etc.). Are these also politically driven? (IP) Scientists who push the view that humans create climate change are young, trying to forge a career in a narrow field by fear, seek government and research grant favour and base their opinions on computer projections about the future. There are no natural scientists I know who have spent more than 40 years of integrated inter-disciplinary science who argue that humans change climate. (SH) Nonsense. I know lots of scientists at the beginning and end of their careers who accept the science of Anthropogenic Global Warming (AGW). At both Exeter and Oxford Universities, where I recently taught, both places were full of them. Actually, the way to make a real name for yourself as a scientist would be to show that AGW wasn’t happening. If you could do that then you would become the most famous scientist in the world. It’s telling that no-one has managed this….including IP. (IP) To argue that temperature has increased 0.80C since 1850 is misleading because the Little Ice Age ended in 1850 and it is absolutely no surprise that temperature increases after a long cold period. (SH) Why is it no surprise? Why should temperatures increase? They only do this in response to the forcings; and since the middle of the 20th century the GHG forcings have begun to overwhelm the natural variability in the climate. IP’s mistake is to think that the climate acts like a rubber ball. Just because it was cold in one period, doesn’t mean that it has to be warm in the next! (IP)Since 1850, there has been temperature increase (1860-1880, 1910-1940, 1976-1998) and decrease (1880-1910, 1940-1976, 1998-present) and the rate of the three periods of temperature increase has been the same.(SH). No, this is wrong. The have been no GLOBAL increases in temperature in the instrumental record comparable to the present one (since 1975 or so). And temperatures since 1998 have NOT fallen…they’ve risen. Look at the data! (IP) A simple question does not get asked: what part of warming and cooling since 1850 is natural? The first two warmings could not be related to human additions of CO2 from industry hence why wouldn't the 1976-1998 warming also be due to natural processes? (SH) This question is regularly asked! That’s why we do attribution studies. IP needs to read the attribution literature…if he thinks it’s wrong then he could try to develop an attribution that explains the present warming and temperature changes over the past 100 years without, aerosol, volcanic and GHG forcing. (IP) It is claimed that, since 1950, human additions of CO2 has been the dominant cause of warming. What is not mentioned is that CO2 is plant food, not a pollutant, and without CO2 there would be no life on Earth. (SH). Irrelevant. Lots of things are pollutants at high levels and not at low levels. Try drinking 10 litres of water quickly and you’ll see what I mean (it will kill you). (IP)The scales and rates of temperature change in the past have been far greater than when humans emitted CO2 from industry. What has caused the cooling (1940-1976 and 1998-present) or, by some tortured logic, is global cooling in this century actually global warming cunningly disguised? (SH) The cooling in the mid-century (which was very mild and nowhere near as marked as shown in IP’s manufactured temperature graph) is attributed to a combination of aerosol and natural variability. There has been no cooling since 1998. (IP)At present, atmospheric temperature is decreasing and CO2 is increasing, again showing that CO2 is not the principal driver of climate change. (SH). Irrelevant and shows misunderstanding. Firstly T is NOT decreasing. Second, there is natural variability. In a dynamic climate system over short periods (less than 15 years or so) the T signal is as large as the noise. That means the natural variability can mask the T signal. A couple of years ago we had a warm spell in April and a cold spell in May. No doubt IP would use these data to argue that summer wasn’t coming and that the seasons aren’t driven by insolation! (IP)Planet Earth is a warm wet greenhouse volcanic planet. The planet is dynamic; change is normal. Five of the six major ice ages occurred when the atmospheric CO2 content was up to 1000 times higher than at present and for half of Earth's history CO2 has been sequestered naturally into algal reefs, coral reefs, sediments, altered rocks, bacteria, plants, soils and oceans. (SH) Irrelevant what happened in the distant past when the oceans, continents had very different configurations compared to the present. (IP)This process is still taking place. Ice core drillings show that over the last 400,000 years, CO2 peaks at least 800 years after temperature peaks.(SH). Irrelevant. This was predicted before we had the ice core data. CO2 acts as an amplifier (feedback) during glacial-interglacial transitions when warming (orbital forcing) warms the oceans, permafrost etc, producing C02 outgassing, methane release and changes to biogeochemical cycles. Orbital forcing alone is insufficient to terminate glaciation. C02 is acting as a forcing now. The physics is the same but the timing is different. How would IP explain the termination of glaciations? (IP)The hypothesis that high atmospheric CO2 drives global warming is therefore invalid. The Earths atmospheric CO2 initially derived from volcanic degassing. Much of it still does and the rest is recycled CO2 from the oceans, rocks and life.(SH). Nonsense. Answered above. (IP)The claim that warming will increase in the future has been disproved by the climate modellers’ own data. Climate models of the 1990s did not predict the El Nino of 1998 or the cooling in the 21st century. (SH). Nonsense. Climate models aren’t supposed to predict stochastic events! Either IP doesn’t understand how models work (in which case he shouldn’t pontificate about them) or he is deliberately misunderstanding them. There has been no cooling in the 21st century. (IP) If such models are inaccurate only 10 years into the future, how can they be accurate for longer-term predictions? Furthermore, when these models are run backwards, they cannot be used to identify climate-driving processes involving a huge transfer of energy (eg, El Nino), volcanoes, solar changes and supernovae. (SH) It’s worth saying that models have predicted an enormous amount. They correctly predicted the cooling from Pinatubo; stratospheric cooling and troposphere warming; arctic amplification; warming of the land compared with the oceans; enhanced warming at night etc. (IP)Climate models tell us more about the climatologists than they do about nature. (SH) I don’t understand. Not many climatologists I know require the solution of partial differential equations to explain their behaviour. On second thoughts…..
(IP)Another claim is that climate cannot be reversed. This invokes a non-dynamic planet. The fact that previous warmings with an atmospheric temperature some 5 degrees C higher than now (eg, Minoan, Roman, Medieval) were reversed is conveniently ignored, as are the great climate cycles driven by the Sun, supernovae, the Earth’s orbit, tectonics and tides seen on modern, archaeological and geological time scales. (SH) I don’t understand the ‘reverse’ bit here. Past warming (Holocene at least) was not global and T were not as high as today. The 5 degrees bit is nonsense. (IP)“Tipping points” are another sensationalist unsubstantiated claim. In past times when atmospheric CO2 and temperature were far higher, there were no tipping points, climate disasters or runaway greenhouse. (SH) terms like ‘climate disasters’ and ‘runaway’ are emotive….no scientists use these (at least not in the scientific literature). Is IP saying that threshold responses have not occurred in the past? If he is, then he’s wrong. (IP)The climate catastrophists attempt to create fear by mentioning the carbon cycle but just happen to omit that significant oxygenation of the atmosphere took place when the planet was in middle age and this process of photosynthesis resulted in the recycling and sequestration of carbon. (SH) Irrelevant to the present day. (IP)The atmosphere now contains 800 billion tonnes (800 Gt) of carbon as CO2. Soils, vegetation and humus contain 2000 Gt of carbon in various compounds, the oceans contain 39,000 Gt and limestone, a rock that contains 44% CO2, contains 65,000,000 Gt of carbon. The atmosphere contains only 0.001% of all carbon at the surface of the Earth and far greater quantities are present in the lower crust and mantle of the Earth. (SH) Irrelevant. (IP) Human additions of CO2 to the atmosphere must be taken into perspective. Over the last 250 years, humans have added just one part of CO2 in 10,000 to the atmosphere. One volcanic eruption can do this in a day. (SH) Wrong. The increase is around 30% or so. Volcanic eruptions do not produce as much C02 as humans. (IP)Climate chestnuts about polar ice are commonly raised. What is not raised is that ice is dynamic; it advances and retreats. While the Arctic is warming, the Antarctic is cooling and vice versa and if ice did not retreat, then the planet would be covered in ice. (SH). Irrelevant and wrong. Of course ice retreats. It is doing now (the majority of glaciers, GIS, much of the WAIS, ice shelves etc). Antarctica is warming (see Steig et al. 2009). (IP) For less than 20% of time Earth has had ice. The Antarctic ice sheet has been with us for 37 million years, during which time there were extended periods of warmth and the ice sheet did not disappear. So too with the Greenland ice sheet which has enjoyed nearly three million years of expansion and contraction, yet did not disappear in extended times far warmer than at present. (SH) Irrelevant. No-one is saying that the Antarctic or GIS is going to disappear….a couple of metres sea level rise by the end of the century might have some consequences though! (IP) Sea level is also dynamic and has risen and fallen over time by at least 600 metres. Since the end of the glaciation 12,000 years ago, sea level rose some 130 metres until 6,000 years ago when it was about 2 metres higher than at present. This is an average sea level rise of more than 2 cm per year. It is now rising at about 1mm per year. This sea level rise has flooded Bass Strait, the English Channel and destabilised the west Antarctic Ice Sheet. It is this sea level rise that has stimulated coral growth, created larger shallow water ecologies and changed the shape of landmasses. (SH) Irrelevant and wrong. Sea level rise is over 3mm per year, not 1mm. With hundreds of millions of people living on the coasts, and major cities located near to sea level, does IP not think that 1-2m of sea level rise by the end of the century will have an effect? (IP)The fear-mongering suggestion that oceans will become acid is also misleading. The oceans are buffered by sediments and volcanic rocks on the sea floor and even in past times when atmospheric temperature and CO2 were far higher than at present, there were no acid oceans. If there had been, there would be no fossils with calcium carbonate shells. Although industrial aerosols are decreasing, the climate catastrophists omit to state that volcanic aerosols kill. At least three of the five major mass extinctions of complex life on Earth were probably due to aerosols emitted by volcanoes. (SH) Irrelevant. There is compelling evidence that ocean acidification is happening, and will become a major issue. (IP)If our climate catastrophists want to twiddle the dials and stop climate change, they need to play God and change radiation in the galaxy, the Sun, the Earth’s orbit, tidal cycles and plate tectonics. Once they have mastered volcanoes, then we can let them loose on climate change. (SH) It’s not a question of stopping climate change. It’s a question of stopping the enormous emissions of GHG and the T rise that has to follow. We’ve known about the Greenhouse Effect since the early 19th century. Maybe IP would like to rewrite nearly 200 years of atmospheric physics? IP) There have not been independent scientific review or financial due diligence on various nation's emissions trading schemes. All that there has been is spin and fear mongering. (SH) This is not science, so no response is required.It is these legislative time bombs across the developed world that will destroy productive industries in rural and industrial areas. (SH). In the end who to believe? We have well-established physics (since 1824) that shows that there is a greenhouse effect; that C02 is GHG (since 1859); and that doubling C02 would increase T by several degrees (since 1896). If Ian Plimer wants to argue these points then he needs to publish his ideas in the peer-reviewed scientific literature. If he’s right then he will win the Nobel Prize. That he doesn’t do so (nor does any other sceptic) is rather telling! All being well, this time next week we will be in Cape Town for Flotation ’09. We are now finalising what has turned out to be, despite the recession, a very successful event. We have an excellent delegate list, currently around 180 delegates representing 20 countries. Notable exceptions? American academics. Although we have a number of delegates from USA, representing mining and equipment companies, not a single academic. I wonder why this is? 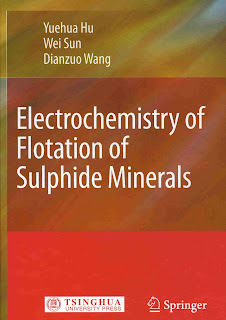 I've just received a copy of a book Electrochemistry of Flotation of Sulphide Minerals by authors at the Central South University in China. If there is anyone out there who would be interested in reviewing this book for MEI Online, please let me know and I will forward the copy. 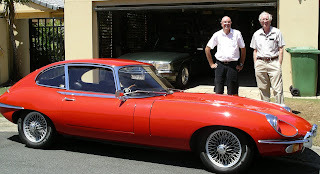 Great picture just in by email of two very well known mineral processors, Tony-Holland Batt (left) and Tim Napier-Munn, posing by Tim's pride and joy, his vintage E-type Jaguar. Tim retired some years ago as Director of Australia's JKMRC, but still retains an active interest in the minerals industry. 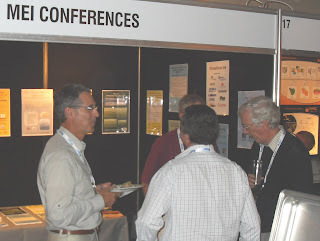 In fact Jon caught up with him only two weeks ago at the Mill Operators' Conference in Adelaide (2nd photo). Tony Holland-Batt is happily retired on the Gold Coast, dividing his time between golf and indulging a long-standing desire to compose music. Samples of his compositions can be heard on myspace.com in the music category under the title "Compositions by Tony Holland-Batt". In his working career Tony lectured at the Royal School of Mines for eight years prior to moving to Australia where he worked for Mineral Deposits Ltd for 23 years. In 1995 he relocated to Denver, Colorado where he worked for Hazen Research before retiring back to Australia in 2000. Two great characters who it is always a joy to meet. The list of papers accepted for presentation at Processing of Industrial Minerals '10 is now available for viewing. It is not too late to submit an abstract if you would like to present a paper next February. 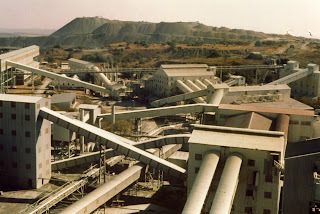 Way back in 1978 I visited the Cullinan Diamond Mine (then the Premier Mine) near Pretoria in South Africa. The mine is famous for having produced the largest diamond ever, the Cullinan, at 3106 carats, now pride of the British crown jewels. Only 5 months before my visit the Premier Rose, at 353.9 carats, was recovered on one of the final grease tables, having passed unscathed through the crushing plant! Recognising that large diamonds could be destroyed during crushing, a large X-ray sorter had been installed just after the primary crusher, although it had picked up nothing by the time of my visit. So it was interesting to see today's story in MEI Online. The new mine owner, Petra Diamonds, has recovered one of the world's largest white diamonds, at 507.55 carats. The discovery is expected to cover costs at the mine for the next two years. What I would like to know is where was it recovered- was it in the primary x-ray sorter? The recent postings on climate change (22 August, 4th October and 16th October) have certainly generated much discussion in the long run-up to Climate Change and the Minerals Industry ’11. It is claimed that there is a scientific consensus about human-induced climate change. There is no consensus. Consensus is a process of politics, not science. Science is married to evidence, no matter how uncomfortable. Scientists who push the view that humans create climate change are young, trying to forge a career in a narrow field by fear, seek government and research grant favour and base their opinions on computer projections about the future. There are no natural scientists I know who have spent more than 40 years of integrated inter-disciplinary science who argue that humans change climate. To argue that temperature has increased 0.80C since 1850 is misleading because the Little Ice Age ended in 1850 and it is absolutely no surprise that temperature increases after a long cold period. Since 1850, there has been temperature increase (1860-1880, 1910-1940, 1976-1998) and decrease (1880-1910, 1940-1976, 1998-present) and the rate of the three periods of temperature increase has been the same. A simple question does not get asked: what part of warming and cooling since 1850 is natural? The first two warmings could not be related to human additions of CO2 from industry hence why wouldn't the 1976-1998 warming also be due to natural processes? It is claimed that, since 1950, human additions of CO2 has been the dominant cause of warming. What is not mentioned is that CO2 is plant food, not a pollutant, and without CO2 there would be no life on Earth. The scales and rates of temperature change in the past have been far greater than when humans emitted CO2 from industry. What has caused the cooling (1940-1976 and 1998-present) or, by some tortured logic, is global cooling in this century actually global warming cunningly disguised? At present, atmospheric temperature is decreasing and CO2 is increasing, again showing that CO2 is not the principal driver of climate change. Planet Earth is a warm wet greenhouse volcanic planet. The planet is dynamic; change is normal. Five of the six major ice ages occurred when the atmospheric CO2 content was up to 1000 times higher than at present and for half of Earth's history CO2 has been sequestered naturally into algal reefs, coral reefs, sediments, altered rocks, bacteria, plants, soils and oceans. This process is still taking place. Ice core drillings show that over the last 400,000 years, CO2 peaks at least 800 years after temperature peaks. The hypothesis that high atmospheric CO2 drives global warming is therefore invalid. The Earths atmospheric CO2 initially derived from volcanic degassing. Much of it still does and the rest is recycled CO2 from the oceans, rocks and life. The claim that warming will increase in the future has been disproved by the climate modellers’ own data. Climate models of the 1990s did not predict the El Nino of 1998 or the cooling in the 21st century. If such models are inaccurate only 10 years into the future, how can they be accurate for longer-term predictions? Furthermore, when these models are run backwards, they cannot be used to identify climate-driving processes involving a huge transfer of energy (eg, El Nino), volcanoes, solar changes and supernovae. Climate models tell us more about the climatologists than they do about nature. Another claim is that climate cannot be reversed. This invokes a non-dynamic planet. The fact that previous warmings with an atmospheric temperature some 5 degrees C higher than now (eg, Minoan, Roman, Medieval) were reversed is conveniently ignored, as are the great climate cycles driven by the Sun, supernovae, the Earth’s orbit, tectonics and tides seen on modern, archaeological and geological time scales. “Tipping points” are another sensationalist unsubstantiated claim. In past times when atmospheric CO2 and temperature were far higher, there were no tipping points, climate disasters or runaway greenhouse. The climate catastrophists attempt to create fear by mentioning the carbon cycle but just happen to omit that significant oxygenation of the atmosphere took place when the planet was in middle age and this process of photosynthesis resulted in the recycling and sequestration of carbon. The atmosphere now contains 800 billion tonnes (800 Gt) of carbon as CO2. Soils, vegetation and humus contain 2000 Gt of carbon in various compounds, the oceans contain 39,000 Gt and limestone, a rock that contains 44% CO2, contains 65,000,000 Gt of carbon. The atmosphere contains only 0.001% of all carbon at the surface of the Earth and far greater quantities are present in the lower crust and mantle of the Earth. Human additions of CO2 to the atmosphere must be taken into perspective. Over the last 250 years, humans have added just one part of CO2 in 10,000 to the atmosphere. One volcanic eruption can do this in a day. Climate chestnuts about polar ice are commonly raised. What is not raised is that ice is dynamic; it advances and retreats. While the Arctic is warming, the Antarctic is cooling and vice versa and if ice did not retreat, then the planet would be covered in ice. For less than 20% of time Earth has had ice. The Antarctic ice sheet has been with us for 37 million years, during which time there were extended periods of warmth and the ice sheet did not disappear. So too with the Greenland ice sheet which has enjoyed nearly three million years of expansion and contraction, yet did not disappear in extended times far warmer than at present. Sea level is also dynamic and has risen and fallen over time by at least 600 metres. Since the end of the glaciation 12,000 years ago, sea level rose some 130 metres until 6,000 years ago when it was about 2 metres higher than at present. This is an average sea level rise of more than 2 cm per year. It is now rising at about 1mm per year. This sea level rise has flooded Bass Strait, the English Channel and destabilised the west Antarctic Ice Sheet. It is this sea level rise that has stimulated coral growth, created larger shallow water ecologies and changed the shape of landmasses. The fear-mongering suggestion that oceans will become acid is also misleading. The oceans are buffered by sediments and volcanic rocks on the sea floor and even in past times when atmospheric temperature and CO2 were far higher than at present, there were no acid oceans. If there had been, there would be no fossils with calcium carbonate shells. Although industrial aerosols are decreasing, the climate catastrophists omit to state that volcanic aerosols kill. At least three of the five major mass extinctions of complex life on Earth were probably due to aerosols emitted by volcanoes. If our climate catastrophists want to twiddle the dials and stop climate change, they need to play God and change radiation in the galaxy, the Sun, the Earth’s orbit, tidal cycles and plate tectonics. Once they have mastered volcanoes, then we can let them loose on climate change. There have not been independent scientific review or financial due diligence on various nation's emissions trading schemes. All that there has been is spin and fear mongering. It is these legislative time bombs across the developed world that will destroy productive industries in rural and industrial areas. Six years has gone by since the last International Comminution Research Association (ICRA) workshop – the highly successful 2003 Cape Town ICRA workshop, where the theme "The application of computational techniques to industrial comminution problems” was tackled. I hear today that members of the comminution community have re-instated the working group of ICRA, with a view to holding a major workshop in association with Comminution ’10 in Cape Town next April. We will post more news on MEI Online as soon as available. After a 44 hour journey home I am back in Falmouth getting ready for next months Flotation '09 conference in South Africa. The 10th Mill Operators conference took place in Adelaide and showed that people are coming back to conferences with an optimistic but cautious view to the future. There were around 300 delegates and the exhibition had sold out months before. The MEI booth had lots of visitors, the first of which was Nick Slade (pictured with me below) from Golder Paste Technology. Nick is also based in Falmouth and was kind enough to invite me out on the Golders boat in the summer to watch some sailing. It's always nice to meet people who haven't been to our conferences but take great interest in our future events. This was my second Mill Ops conference and once again it was well organised with a good dinner and the now expected comedian! Jon and I back in the office this morning, me after 10 hours door to door from Istanbul, and Jon 44 hours from Adelaide!! Following our lunch, you may care to place this contribution on your blog and I'll watch for the brickbats! I read the climate debate with interest and tend to agree with those who have taken your South African contributer to task. I thought you gave a balanced set of answers but reading his responses I can see that Galileo was right -"...we all tend to see what we expect to find". Regarding Ian Plimer, I first came across him when I was writing "Ore Deposit Geology" with Richard Edwards and therefore when I saw his article "Climate Change, a geologist's view" in Materials World, March 2009, I wrote to him as I thought his was an interesting view on the subject. He replied that his book, which you cite, had become a best seller in Australia and he was touring the country on book signings – not normally associated with academic authors! I have yet to read his book so cannot comment on the veracity of its findings, but I am struck by the emphasis that some of your contributors place on peer review. I agree that peer review is the best we have but what concerns me is peer review cannot always assess the original data. Remember the falsified Indian fossils saga? Furthermore I wonder how many reviewers check/rework the results and, of course, unless you have access to the programs and the models into which the data are fed you have no control over the predictions. Like you, I have experience of models produced by well recognized people which, when examined in detail, i.e. line by line, had some fundamental errors with far reaching, and erroneous, consequences. Have we all forgotten the Club of Rome and the Limits to Growth debates of the late 60's early 70's and the dire predictions for global mineral resources based on "models"? For those who have, we shouldn't have any mercury, tin etc by now! Having got that off my chest I'd just like to make some observations based on geological data. Global temperatures have varied, often dramatically and over short time frames, throughout Geological Time. We could, of course, talk of the climate in "Britain" during the Cretaceous, or Triassic, as being much hotter than today but really that would have little bearing on today's position. Therefore we can look at the Holocene, and perhaps just the last 10,000 years and the Flandrian Transgression. As you know, the last major Glaciation ended about that time and sea level, globally, was over 100 metres below Present Day. This means that over the last 10,000 years sea level globally has been rising by an average of 1metre per hundred years (10mm p.a.). This, I believe, is equivalent to the most severe of the current climate model predictions for the next hundred years. Coming more up to date, the longest tidal gauge records for Europe suggest a small, but steady, rise since records began (c1800), with an acceleration over the last half century to about 2mm per year. For comparison, it has been calculated that around 8,000 years Before Present some 18 trillion metric tonnes per annum of glacially derived water was being added to the oceans and the global sea level was rising by about 50 mm per year. We have to talk of global because, with isostatic adjustment due to offloading ice, some land was rising and sea level in those areas was falling relatively. About 7,500 years ago the Climatic Optimum occurred when global temperatures may have been as much as 4degrees C higher than today. There is plenty of published work containing figures for specific areas. For example if we consider the North Sea between 8000 and 3000BP sea level rose from 55metres below present to 6 metres below present (therefore from 3000BP to today the average rise has been 2mm p.a.- the accelerated rate quoted above ). What does all this tell us? Very significant global temperature variations, with concomitant sea level rises, have been occurring long before humans tramped the Earth and also while they have tramped the Earth but before they used massive amounts of fossil fuel sources (Oil, Coal) to contribute Carbon Dioxide to the atmosphere. Without going into the debate over the universality and accuracy of the temperature readings which you mention, as global temperatures are rising the big question - which I think you have already posed - is to what extent is man contributing? There is plenty of evidence to show it has happened in the past without "help" from man. In any scientific experiment you'd want a "control", unfortunately in this debate there isn't one, i.e. would this temperature rise (and sea level rise) have occurred anyway? This is where you need to examine the models very carefully - how do you establish the base level? how do you calculate the 'normal' annual effect (ie without man's influence), are there any missing variables, etc etc? Finally, if we look at glacial/interglacial precedents, based on Milankovitch Cycles and previous interglacial stages, the Earth should be going towards another Ice Age, after the Climatic Optimum quoted above (you make reference to this in one of your comments to your South African contributor) so if man is having a marked effect what we may be seeing is a delay imposed on the next Ice Age!! I think you have chosen a great topic for your future Conference let us hope that there are people there who can provide stimulating papers whatever their stance. Incidentally, you may remember that in 1997 in conjunction with the University of Plymouth and the Plymouth Marine Laboratory I tried to establish a Centre for Climate Impact Forecasting (CCLIF) in the South West of England to help Insurance Companies, Banks etc understand the likely effects of Climate Change – and we failed to get funding support. How times have changed!! All the best to you and Barbara and everyone associated with Minerals Engineering International. We experienced wonderful Turkish hospitality last night, as dinner guests of Guven and Nese Onal. Their driver met us early evening and drove us through the Istanbul rush-hour, which made driving on the M25 look like a ride in the park. After a one and a half drive, passing through Black Sea resorts, we arrived at a renowned fish restaurant on the banks of the Bosphorus, where we enjoyed local sea-food delicacies and convivial company. It is the long journey back to Falmouth today. Not as long as Jon's journey home from Adelaide though. His email this morning was from one of his stop-offs, in Dubai. His total journey time to Falmouth will be just under 2 days! The PIM '10 conference hotel really is wonderfully situated in the heart of the old city, with no need for taxis to get around. This morning Barbara and I walked to the Golden Horn, only 30 minutes away, then crossed the Galata Bridge into the New City. After a steep walk we reached the Galata Tower, one of the world's oldest towers, affording magnificent views of the old city and the Bosphorus (photo above). More abstracts in today for the conference, which is looking like being a good one. Barbara and I are in Istanbul for a few days with our Falmouth friends Judy & Mike. We had lunch in the old city today with Guven Onal and his wife Nese (top). Guven is our consultant for Processing of Industrial Minerals '10, to be held in the old city in February. We are staying at the President Hotel, the conference venue, only 5 minutes walk from famous landmarks such as Aya Sofia (left) and the Blue Mosque (right). Jon emailed today from Adelaide. The Mill Operators conference is going well but he is having problems accessing the blog, so hopefully will report on the event this weekend. Power blackouts forecast for Britain- is fusion the way ahead? Britain faces a return to 1970s-style power blackouts and disruption to its electricity supplies within four years, the energy regulator warned yesterday. Ofgem raised the spectre of a return to the three-day week for British industry as the country scrambles to renovate its crumbling power infrastructure ahead of new EU pollution rules that will force the closure of a quarter of UK power stations by 2015. This report came at the same time that New Scientist reports on how an international consortium known as ITER (“the way”, in Latin), is ready to start building a prototype fusion reactor in Cadarache, France. Critics will carp that there are still important questions to be asked. Why bother to build a fusion reactor when there is a perfectly good one 8 light-minutes away? Why not spend the $10 billion – likely to be an underestimate – on wind or solar power instead? Stephen Battersby, the article author, argues that these questions are easily answered. We need as many clean energy options as we can get, and commercial fusion power is within sight. Thanks to studies carried out in recent decades, the science that ITER has to rely on is well established. The challenges lie in the technology, such as developing wall materials to withstand the pummelling by subatomic particles and cutting the cost of the superconducting magnets that will confine plasma that is 10 times the temperature of the sun's core. The more that we spend now, the sooner we'll reach our goal. The last surge in spending on fusion came during the 1970s, when oil-producing countries in the Middle East cut supplies to the west. As delegates prepare for December's climate change conference in Copenhagen, the case for boosting funding is stronger than ever. Whatever the outcome, the risk of dangerous climate change is a real one, prompting thoughts of draconian measures to tackle it. Compared with the more exotic schemes for large-scale manipulation of the environment now coming under serious consideration – which do look 50 years away – fusion power is a racing certainty. It's safer too. A technology that messes with our planet's climate is what got us into trouble in the first place. 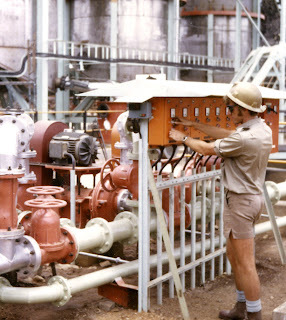 It's hard to believe that it is 40 years ago this week that my career in the minerals industry began. In October 1969 Barbara and I arrived in Chingola, Zambia, after an adventurous journey from UK. We sailed from Southampton to Cape Town on the 'Windsor Castle' and then drove up through South Africa and Rhodesia and into Zambia. 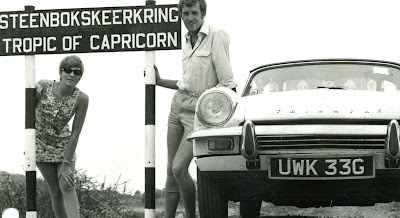 The photo show us in South Africa, crossing the Tropic of Capricorn near the Rhodesian border. I had no idea what to expect on arrival at Nchanga. I had just finished my PhD in physical metallurgy, and when offered the job in Zambia I said to the recruitment officer "but I don't know anything about mineral processing!" "Don't worry", he replied "it's only bucket chemistry!!" I have never regretted my time in the minerals industry. I have seen wonderful places and met very colourful characters (and a few prats!). Retire? Never- I am now looking forward to my next 40 years in this wonderful industry. Jon is in Australia at the moment, en route to Adelaide for the AusIMM Mill Operators' Conference, which starts on Monday. He will be posting a few reports on the blog. If you are attending the conference, call in at the MEI exhibit booth for a chat. Barbara and I will be in Istanbul next week, finalising plans for February's Processing of Industrial Minerals '10 conference, which has already attracted over 50 papers from around the world. Look out for a few photos next week of this exciting city. 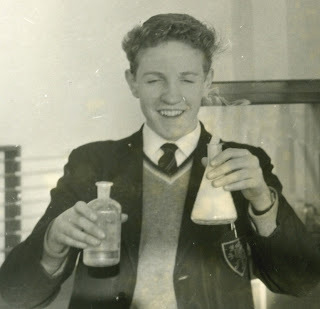 Two very ancient pictures of me - the first one messing around in the school chemistry lab in 1960, and the other 12 years later on the Nchanga tailings leach plan in 1972. The connection? A report in yesterday's Times that many schools are phasing out chemistry practicals because of health and safety concerns. The safer option is to watch experiments being performed via the internet, This is worrying, as most people who pursue a scientific career were inspired by practical experiments at school. I remember mixing chemicals to produce the most noxious smells and violent reactions, and I never saw or heard of any serious injuries- a few holes in shirts and jumpers due to acid burns maybe. Where will this end? Presumably if students aren't introduced to practical work at school, the next stage will be a reluctance to initiate them at University. No more dangerous laboratory ball mills, or nasty furnaces which can burn fingers. And perish the thought that a young graduate might be let out onto a plant with all the inherent dangers of heavy machinery. Cone crushers!! Not within a million miles. How reliable are the input date to climate change models? As is probably evident from the earlier posting on the climate debate, I have some degree of scepticism regarding totally anthropogenic climate change. The robustness of the models has always been a concern, and whether all the possible variables, such as natural earth and sun cycles, have been taken into account, as well as the interactions between dependent variables. Questions I hope will be answered at Climate Change '11. A few days ago Amanda and I attended a lecture in Falmouth by Dr. Stephan Harrison, a quaternary scientist at the University of Exeter, and an advocate of human-induced global warming. I have to say that his lecture, crammed with data and graphs, was very impressive and presented a most convincing case for anthropogenic warming. It was evident that the mathematical models are now very sophisticated and take into account all known variables, including cycles of the sun, oceans, and vulcanism, but I have to admit that I left with the same degree of scepticism. No matter how big and powerful are the computers, or the sophistication of the models, the latter are only as good as the input data. The two most important inputs, and the subject of the debate, are atmospheric CO2 content and mean atmospheric temperature and I am not at all clear as to how the levels of these variables can be effectively compared over long time intervals. In recent years satellite technology has been employed to measure temperature, but prior to that temperatures were measured by thermometers in stations around the world. During the 20th century the number of stations providing data must have fluctuated, and those situated in or near cities must have been influenced by the 'urban heating effect'. So, in my naivety I ask if anyone can provide me with a convincing argument that average annual temperature readings over a period of, say, one hundred years can be reliably compared. The same question applies to CO2 levels- were they measured as accurately a century ago as they are now?